Samson's Stage X1U USB Digital Wireless Bundle brings freedom, convenience and high-quality sound to your computer recordings and digital communications. 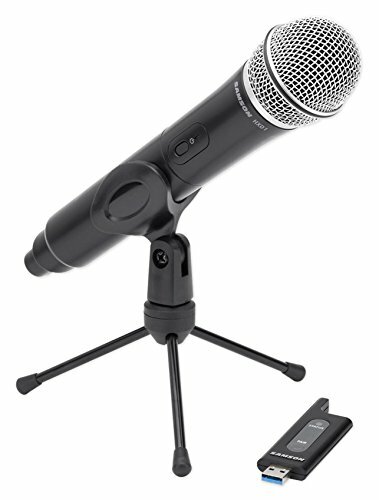 Using a USB-powered receiver and a handheld transmitter with Samson's Q6 Dynamic Microphone capsule, the Stage X1U provides 100' of wireless range, simple setup, and natural, detailed vocals. Tripod stand and mic clip included. Unlike traditional wireless systems that require complex setup processes such as matching component frequencies, the Stage X1U automatically pairs the receiver to the transmitter. Direct connection to a computer's USB port enables instant transmission of audio to your DAW, VoIP and speech-to-text software without the need for extra cables or external audio interfaces. It's even compatible with iPads and iPhones (4S and later) using Apple's Lightning to USB Camera Adapter or iPad Camera Connection Kit (30-pin). Need to make a quick video When used with your computer's internal webcam, the Stage X1U is ideal for creating quick audiovisuals for tutorials or music performances on YouTube. The included tripod stand and mic clip also makes the Stage X1U a perfect VoIP solution for office desktops and conference room tables. In addition to digital communication applications, the Stage X1U can be used with Samson Expedition Series Portable PAs that feature USB Wireless ports (XP106, XP800, XP1000) to create a completely mobile wireless presentation/performance solution. Up to two Stage X1U systems can be used simultaneously in the same location to accommodate multiple performers. Modulation Type: GFSK. Frequency Respose: 20Hz-16KHz. Signal To Noise: >85dB. Microphone Element: Samson Q6 dynamic. RF Power: <10 mW EIRP. Battery Life: 20 hours from 2 x AA batteries. Accessories: Tripod stand, mic clip. Shipping Dimensions (H x W x D): 11.5" x 6.25" x 2.75" inches. Shipping Weight: 1.5 Lbs. If you have any questions about this product by Samson Technologies, contact us by completing and submitting the form below. If you are looking for a specif part number, please include it with your message.